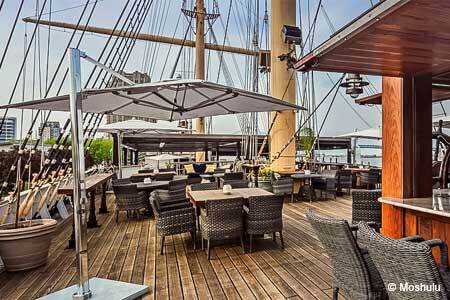 Dine aboard a clipper ship that offers decidedly modern food. : The great old ship Moshulu is in port with beautiful interior rooms and interesting cuisine. You never forget that you are on a ship --- the deck lists a little, which only adds to its charm. The interior features a plantation meets Polynesian South Seas décor. Try the lobster bisque, blue cheese and bacon-crusted swordfish, or Australian lamb with heirloom tomato and goat cheese tartlette. From a well-priced wine list there are many international favorites. Serving pieces offer stylish table accents, from modern china and flatware to groovy martini glasses. This is definitely a spot for a special occasion. The topside Bongo Bar, with its river view, serves up fruity libations and an international menu of grilled dishes during the summer season, sometimes with live music.